Can we go back one more time to my pre-Thanksgiving criticism of Gary Francione (in this comment, to be precise)—the objection that launched a thousand ad hominems? At the time, a few commenters felt I had him wrong and would see this if I just read his book about the animal rights movement—Rain without Thunder. I figured I’d read enough (his first book, some articles, his website), but I was curious. Now that I’ve read it, I’m all the more baffled by all the hostilities. In fact, the book just substantiates the charge. I said Francione wants to keep animals in the worst possible conditions to achieve abolitionist goals. Well, yes. At least he wants to keep them in much worse conditions, and part of the reason is to achieve abolitionist goals. Francione is against reforms like Proposition 2 in California, and the recent referenda in Florida and Arizona, but what you learn from the book is that he’s also against the Humane Slaughter Act, the Animal Welfare Act, and any reform that ameliorates the treatment of animals without actually liberating them. The AWA is inadequate, as many have argued (and I argue in my book) but it does provide very basic benefits to animals, like pain relief during experimental procedures, bigger cages and appropriate diets, rest stops and water every 5 hours for animals being transported etc. The Humane Slaughter Act covers too few species and is inadequately enforced, but it does require stunning before slaughter for cattle. I don't see him saying in the book that this legislation doesn't alleviate suffering; clearly it does. But he fears such reforms will increase the use of animals for food, experimentation, etc. So they will retard progress toward abolition. So (he thinks), possibly I ought to give a thirsty cow water on the way to slaughter, but if I try to make sure all cows have water on the way to slaughter, I’m disregarding their rights. I’d be respecting their rights more if I just let them be thirsty on the way to slaughter, and concentrated on vegan education. But surely not. If we are virtually powerless to liberate animals from farms and labs, then we certainly don’t violate their rights by passing laws that insure that lab and slaughterhouse workers do at least more of what they should to alleviate suffering. Francione repeats over and over again throughout the book that “new welfarists” support humane reforms as a means of working toward more fundamental change. Thus, he thinks the success of these reforms can be measured based on whether they are actually producing fundamental change. By that measure, they’ve failed. The Humane Slaughter act has not reduced the number of animals killed, and I believe the AWA hasn’t either. But surely that's not the intent of animal advocates, and not the right standard for judging anmal welfare legislation. Animal advocates want to alleviate suffering simply because it's bad. They have further goals having to do with justice and fundamental change. But they don't want to alleviate suffering in order to achieve those more distant goals. The right way to judge animal welfare legislation is to consider a counterfactual world--one just like this one, but without the legislation. There's more misery in that world, and no less killing and injustice. That's a worse world and we're right to avoid it. Time to move to greener pastures. San Jose State University recently (I'm not sure if they are continuing) banned all blood drives on campus because the policies that they use to determine who is elligible to donate blood explicitly excludes gay men, regardless of other risk factors. They saw this as discriminatory, and I agree. But banning blood drives seem to just harm those who are in need of blood. I think Francione and SJSU have all the best intents and noble ideals.... But their methodology for trying to get their point across is fundamentally flawed. Hmm, but in that case, if you stop collecting blood, you stop the injustice of discriminatory blood-collecting. So I can at least see the thinking behind the ban. In the case of animal welfare legislation, if you get rid of it, or don't add to it, you don't thereby end any injustices. How about being against humanitarian legislation about warfare (Geneva Conventions, bans on chemical weapons, possible bans on land mines) because it might prevent people from ending all wars? [E]ven if I am obligated to give a thirsty cow water on the way to slaughter it does not follow that I should pursue that obligation as a legal or social policy, for the practical reason that it will never and can never succeed on an institutional level, and for the theoretical reason that it conflicts directly with the notion that animals have rights. "We should legislate that animals on the way to slaughter be given water if they are thirsty." I just don't get it. I need to know what rights animals have that conflict with giving them water when they are thirsty. He says "conflicts directly." What is this right that conflicts directly with anti-thirst legislation? Why does the admitted obligation to give water fall away when hitched to legal and social policy? Clearly there is a large theoretical backdrop here required to make sense of these assertions. "The new welfarists believe that it is both coherent and morally acceptable to disregard the rights of animals today (by pursuing welfarist reform that reinforces the property status of animals) in the hope that some other animals will have rights tomorrow.” (pg. 39)"
The new abolitionists believe that it is both coherent and morally acceptable to disregard the suffering of animals today (by rejecting incremental reforms that alleviate the suffering of animals) in the hope that some other animals will have less suffering in the future. I'd say this is the core disagreement no? Faust, Frankly, I don't think what he's saying makes any straightforward sense. It would be impossible to point to a specific right that's violated by requiring that animals be given water periodically. Perhaps what he's saying, but not saying straightforwardly, is that animal advocates get themselves into a peculiar state of mind when they support regulations for practices they object to. To regulate is (sort of) to first endorse what's being regulated. The thing is--I don't even see that point as making sense. Supporting regulations for X doesn't mean endorsing X. It just mean admitting that X is going to happen, whether I like it or not. Jean- hmmm good point about my analogy. Maybe not the best for this purpose. Faust, Re: the second quote. I think this is all a polemical game. He's trying to invert an objection that he knows could be leveled against him. Someone could say (in fact, this is exactly what I've said)--he wants to ignore the welfare of present-day animals in order to secure the rights of future animals. To preempt this accusation, he claims that so-called welfarists are the ones who are guilty of this sort of ignoring of today's animals for the sake of future animals. He alleges that they are ignoring the rights of present-day animals in order to secure fundamental change in the future. But this is nonsense for many reasons, one being that improving welfare for present-day animals doesn't violate their rights. B - 100 cows are slaughtered following passage of legislation for provision of better drinking facilities in slaughterhouses and during transport. These cows are less thirsty than they would have been in state A. There are a number of different ways that rights-theorist (R) might reject the 'welfarist' claim that B should be promoted (assuming that state C where no cows are slaughtered is not realistically possible in the short term). 2. R might claim that B is *no better* than A because what matters is whether or not an animal's rights are being respected, and since there are still 100 cows having their rights violated (even if their rights are being violated to smaller degrees) B is just as wrong as A. I can't tell whether Francione endorses this view. 3. Alternatively R might claim that B is only trivially better than A. This related claim (to 2) is that the reduction of suffering is swamped by the wrong of the animal being treated as property etc etc The difference is so insignificant that it is not worth the animal advocate wasting his/her time and energy on. Separating out these possibilities it seems to me that there are two key differences in the way that the deontologist/rights theorist sees the problem from the way that those who are inclined towards consequentialism see it. The first is that for R animal suffering is only a small part of the problem (it is a symptom if you like), while respect for the moral status of the animal is central. In contrast, for the consequentialist, suffering is the largest part of the problem. Depending on their philosophical bent they may or may not worry about other wrongs such as respect of the animal's rights. These differences explain why alternatives 2/3 above are plausible to R, but utterly mysterious to the consequentialist. The second key difference is (obviously) the focus on the action versus focus on the consequences. R is concerned about what the agent does, and what their action represents. The 'welfarist' is crucially concerned about what happens as a consequence. This gives rise to explanation 4. I fail to understand how you can read Rain Without Thunder yet still come to these conclusions. Here's an article worth reading by another abolitionist author. It discusses rights and advocacy for nonhuman animals. Brandon, I don't understand why you don't understand. So--we're tied! I linked to Dunayer's article in thread earlier this week, so yes, I've read it. I've also recently read her book "Speciesism." I don't think bringing her in as back up really helps, because she says much the same thing as Francione on these specific issues. Dom, That's a lovely rundown of the possibilities. I think at different points Francione seems to be saying all of these different things. I don't think #4 is really it, because he's definitely got his focus on animals, not just on agents. No virtue ethics for him, no ethics of care (which is good, I think). So I'd say it's #2 or #3. Clarifying that helps me say where I think he goes wrong. It's bad that basic rights are being violated in A and B (if we want to go for rights talk--and I think there are alternatives), but B is still importantly better than A. We should pursue B unless we have hard evidence of a great increase in killing (etc) as a result of the legislation (which we don't have--bearing in mind the aforementioned fallacy!). I was thinking about this in connection with the Holocaust last night. Of course the greatest atrocity of the Holocaust was the killing of 6 million Jews (and millions of others). But there's a reason why we ought to read the horrifying first person accounts. We don't get beyond the number killed by doing so, but we come to understand the utterly staggering depths of the suffering. It might seem impossible that the Holocaust would have been less terrible with less suffering, but you're just dishonoring people's experience if you say otherwise. I think the same thing about factory farming. The greater suffering in A does make it importantly worse than B. We should not be blinded to that just because we are also serious about rights for animals, or respect for animals, etc. "Of course the greatest atrocity of the Holocaust was the killing of 6 million Jews (and millions of others). But there's a reason why we ought to read the horrifying first person accounts. We don't get beyond the number killed by doing so, but we come to understand the utterly staggering depths of the suffering. It might seem impossible that the Holocaust would have been less terrible with less suffering, but you're just dishonoring people's experience if you say otherwise." I have to admit I was thinking about EXACTLY this today. I thought to myself: what if the holocaust had resulted in 6,000,000 deaths, but each of the people killed had been treated perfectly decently prior to being killed. It seems obscene to think about it at all really (mostly because the holocaust is just hard to think about). And not very plausible for that matter. But if you put on your super absurd nerdy philosopher's imagination hat and imagine it without the starvation and torture...something like the world in that movie "The Island" it's still a kind of holocaust. But it's a different kind of holocaust. It does seem strange to say that the differences between the real Holocaust and this counterfactual holocaust make no difference at all. There's another way to look at this whole issue. There is certainly no shortage of worthwhile goals to pursue in this lifetime. In the unlikely event that someone were to convince me that the best we can do for animals is to devise ever more-efficient ways to exploit them, then I would simply hop on another hobbyhorse, such as the abusive and irrational practices rampant in the mental-health industry or the lack of critical thinking in society. Alex, Well look, the Humane Slaughter Act produces a more efficient system in just the way that electrocuting prisoners is more efficient than hanging them. But should we dismiss the benefits to animals just because there are also benefits to farmers and prison staff? But yes--there are lots and lots of causes. Nobody really has to get involved in humane farm reform. I can see that for some people it's an uninspiring or even distasteful thing. I just think that even so, it's the right thing to do. Now that I have read the arguments in question, I see you left out something crucial. Yes, he thinks I may (just may, not must) give the cow a drink, but I must not pass a law so that everyone has to give the cow a drink. Your quote was supposed to show that I misunderstood him, but a more complete set of quotes shows that I don't! Jean, I left out the quote because I thought it was a given that Francione is opposed to institutional-wide "reforms". The quote I did include referred to a specific situation in which one may have a moral obligation to help an animal in distress. I still think you misunderstood him. The main source of confusion is, I think, your belief that welfare-type reforms are actually beneficial to animals. Francione argues (persuasively, in my opinion) that the status of animals as property ensures that truly meaningful reforms are not possible. Any "reforms" that are instituted will be largely circumvented, by cheating and/or by importing cheaper products from other locales that lack the regulations. Or, more likely, the "reforms" will actually improve the efficiency of production under the false pretense of alleviating suffering. Further, the "reforms" will delude well-intentioned consumers who may think that it's now morally acceptable to consume the "humane" products. I continue to think that your original statement ("Francione wants to keep animals in the worst possible conditions to achieve abolitionist goals") mischaracterizes and trivializes Francione's arguments. Alex, The issue here is Francione's stance on institutional reforms, so obviously the quote about institutional reforms is relevant. He's the one bringing up a thirsty cow, not me. 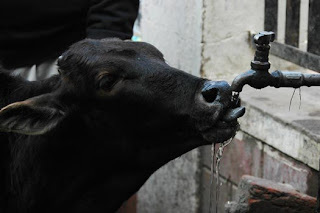 Obviously, giving water to a thirst cow alleviates suffering. So if he thinks that's an apt analogy, then he thinks some animal welfare legislation alleviates suffering. To say otherwise would be just wild. In fact, in I don't think that in Rain without Thunder he says the AWA and the Humane Slaughter Act alleviate no suffering. Anesthesia and analgesia for lab animals obviously relieves suffering. Yet he objects to all this merely "ameliorative" legislation. Why? I think I explained it fairly in the post. He's worried about consequences-- more animals being killed, slower progress toward abolition. He's also worried about the rights of "animals today." He thinks welfare reforms somehow violate the rights of today's animals. I haven't trivialized his argument I've (gasp!) objected to it. To repeat a point I've now made many times--people who object to injustices like the death penalty do not object to making the method of execution more humane or giving death row prisoners more phone calls. They don't say no to these things on grounds that they somehow violate prisoners' rights or make the public more comfortable with the death penalty. They don't say today's prisoners should suffer more in order to hasten progress to abolition (of the death penalty). When Francione says these things, I suspect he is not thinking of animals as persons, as he claims to. I also don't think he's resonding empathically--he's not asking "what do these animals want?" I think that's a good question to ask. from, say, Colombia, create a situation of violent crime, comparable to the drug trade? So let's compare ideals with ideals or realities with realities, ok? Amos: That is why abolitionists typically favor creative vegan education as a means to reduce (and, one hopes, ultimately eliminate) the demand for animal products. Supply-side advocacy, such as passing legislation that would restrict the sale of animal products, is not practical, as you imply. For a good example of creative vegan education, see www.vegfund.org. I support them with my contributions. And in my own life, I try hard to introduce my omnivorous acquaintances to vegan foods. I never, ever urge them to switch to organic, free-range, prairie-fed, certified humane eggs (or whatever the flavor-of-the-day happens to be). Alex, That NYT editorial definitely does not object to making the method of execution more humane. It says that such changes aren't enough. There's a huge difference. I think Francione should stick with saying that existing animal welfare legislation is not enough. I would agree with him entirely if that were his point. Alex: The chief demand of the abolitionists, that animals are no longer property, is a legal reform, and like all legal reforms, may produce cheating or other forms of non-compliance, for example, a black market in meat. So let's compare the possible effects of legal reforms, whether they be abolitionist or welfarist, in the real world. By the way, the fact that a law produces non-compliance does not mean that the law is bad. I just took the test mentioned above. Although I'm a meat eater I scored 17 strongly agree, 2 strongly don't agree and one between. There doesn't seem to be a strict correlation between love of animals and eating habits. Amos, abolitionists are not usually involved in advocating for any sort of legal actions. The legal system typically follows social change instead of leading it. Declaring animals as persons -- in a legal sense -- is many years down the road. In the meantime, the best strategy is to convince as many people as possible to go vegan. One organization I particularly like (and support with modest contributions) is VegFund. Alex: Now, you have me completely confused. Why do you call yourself abolitionists if you're not in favor of an immediate legal change in the status of animals, that is, that animals are no longer property? The original abolitionists, the people who opposed human slavery, wanted to changed the legal status of slaves, immediately if not sooner. They were not concerned about the attitudes of the slave-owners or about changing social customs before changing the law regarding slaves. In fact, many of them were willing to use military force to free the slaves. Now, if you're basically interested in slowly convincing people to become vegans, I sympathize with you, but why call yourselves abolitionists?